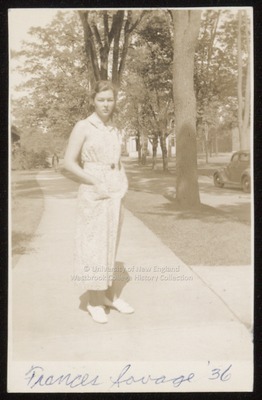 Westbrook Junior College student, Frances Savage (Taylor), poses on the sidewalk, hands in her pockets, in this sepia toned candid snapshot labeled on the photo front Frances Savage '36. Frances wears a long, figured, light-colored sun dress with halter neck and collar, belted at the waist. Her shoes are white with a small heel. She looks directly at the camera, and her expression is serious. Her hair is softly waved and curled and tucked behind her ears.